I’m in the process of improving my garage/workshop. 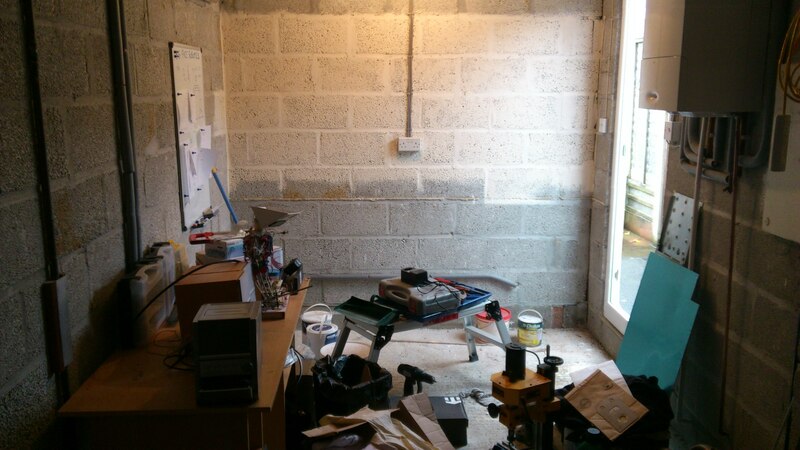 I have removed the workbench and got rid of it and started painting the walls and floor. I plan on building myself a fitted workbench with an area for my pc, a soldering area and a bench for the milling machine and a bench vice. 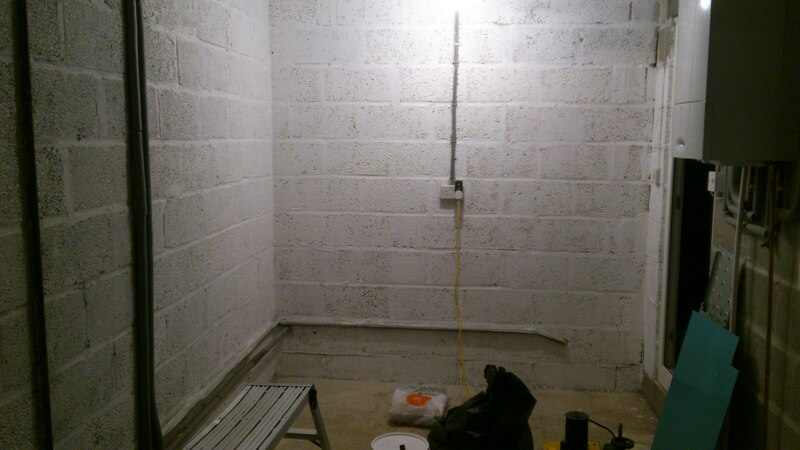 I’ve made a start with painting the walls. Painting blocks is a laborious task but well worth the effort, for the look and the lack of dust when it’s finished. 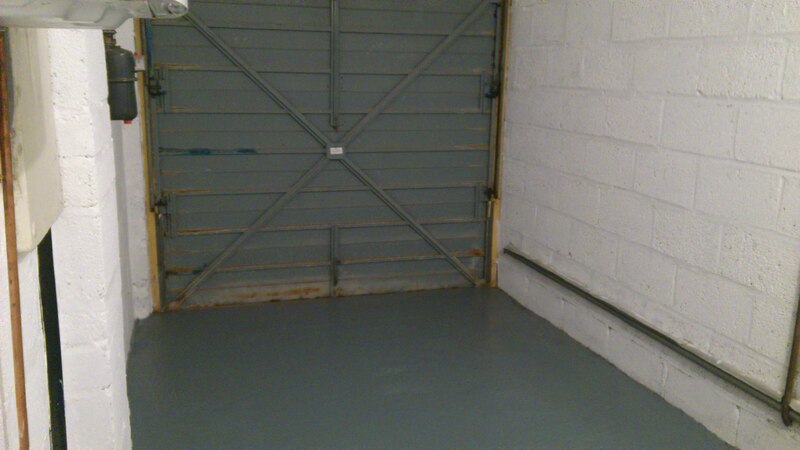 I’ve spent the last few days painting the walls and several coats later I’m happy enough with the result. I may do another coat at some point but I wanted to move on to the floor. I bought some grey floor paint and I’ve put it on thick so I only have to do one coat. Have a look at the picture below to see how its looking. I have been working on constructing the workbenches that will occupy my workshop. I ordered 15 2.4m lengths of 2″x4″ cls timber to make the framework of the benches and a 8’x4′ sheet of 18mm plywood to make the work tops. I planned for a corner workbench that will become the work station for my pc and a soldering station. As well as this I wanted a higher workbench for the milling machine and bench vice to sit on. I started by building a 5’6″ long bench and then adding another section to make it into a corner bench. The pictures below show the first bench and then the extra bit added on. I also constructed a workbench that is 5’6″ long and around 95cm tall (sorry for mixing units here). I purposely made this bench tall as I will be standing at it and I didn’t want to be bending over too far if I could help it. I added the work top and made a back board to stop things rolling off the back of the bench. Check out the piccy below. 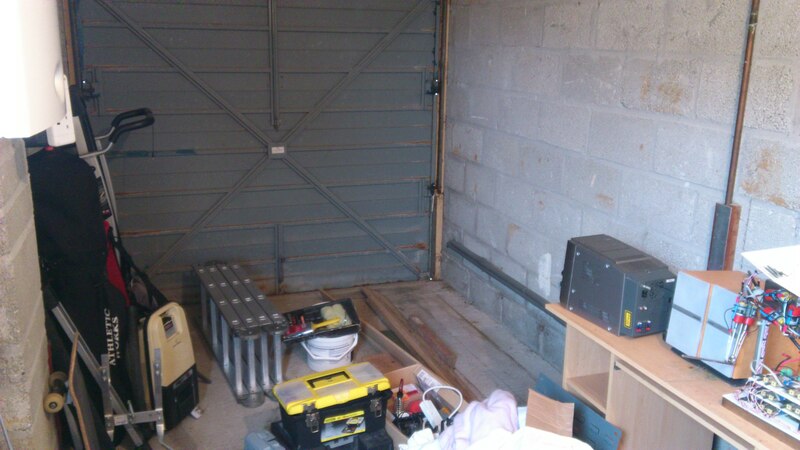 As you can see, I also added a shelf below for storage of tools and such. I also boxed in some pipework that was running down the wall to protect it. The next job is to paint the worktop to protect it as the plywood is relatively soft and may damage if not protected. I think I’m going for a white gloss finish, not sure how this will look but there is only one way to find out! So my new workshop is finished for now. I have painted the bench tops with white gloss, hung everything on the walls and bolted the milling machine and new bench vice to the bench top. The pc is in place and the soldering station is set up. I’ve also added some hooks to the wall for cables and the like. Check out the finished workshop below.